True Ingredients: Only carefully selected ingredients are used. True, rare and natural herbs. 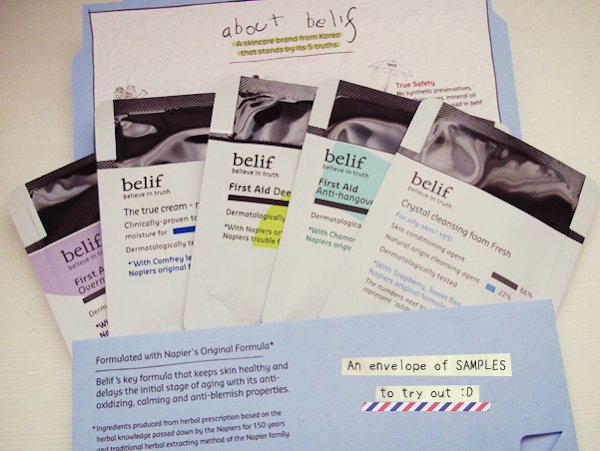 True Formula: Belif uses Napier's traditional herbal processing methods proven for preserving efficacy of the herbs. 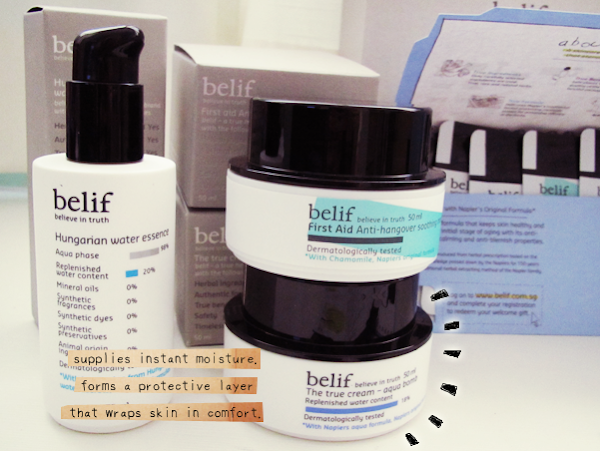 True Benefit: Belif places their emphasis on the quality of product instead of fanciful packaging. 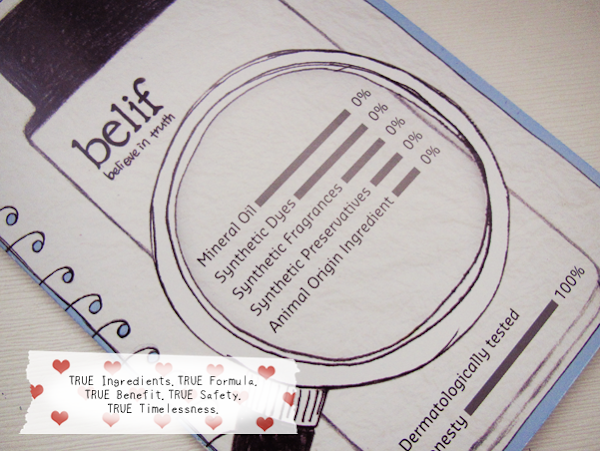 True Safety: No synthetic preservatives, dyes, fragrances, mineral oil and ingredients of animal origins are used. True Timelessness: The formulae used are relevant now and for a long time to come. Belif is sitting in the basement of Wisma Atria, where Holika Holika used to be (Where did Holika Holika go?!? ):). I passed by the store a gazillion times (Orchard is really my second home.) and was attracted to the drawings of their products like a bear to honey. Also, it's pretty difficult to miss the store since there's an arch of purple balloons right in front of it. Haha. A couple of weeks back, Chantana tweeted about the Aqua Bomb and how after 3 days of application, her face didn't have the tight feeling (I think.) and that piqued my interest because I was like Sahara Desert in person *rolls eyes*. I popped by the store one day and was attended to the most patient salesgirl ever. Her product knowledge was way incredible! 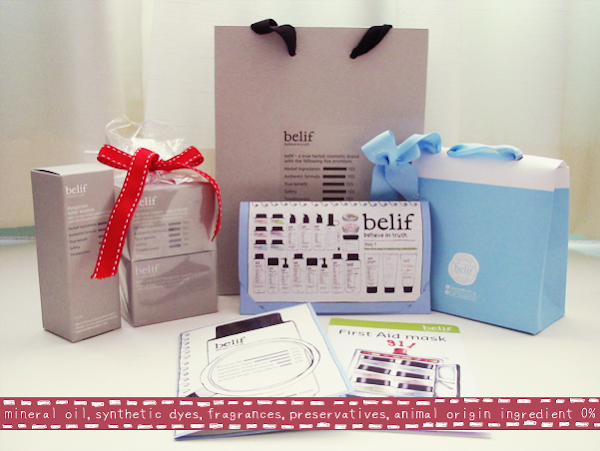 She could tell me about the ingredients and their benefits in the products which I inquired, in details! I didn't get anything that day but before I left, she passed me a sample of the Aqua Bomb. I have been spamming Laneíge's Sleeping Pack for the past few nights and that has helped to heal my skin quite a lot. 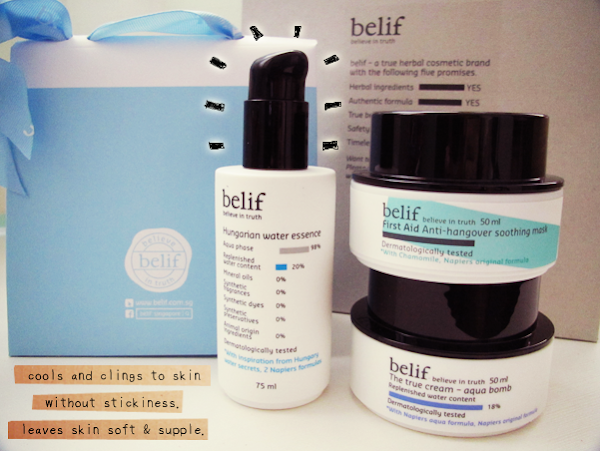 Sadly, after I rinsed my face in the morning, my skin would start to feel tight again. Last night, I decided to use my sample of the Aqua Bomb. It brought immediate relief to my skin and kept my skin hydrated the entire night, much like the Laneíge one. BUT BUT BUT the thing is, after I rinsed my face this morning, my skin didn't feel tight at all! Also, Chantana's timely review on it pretty much cemented the Aqua Bomb on my to-buy list (Or rather, MUST-by list.) for today! So... TADAHHH!!! Here's my loot! Hahaha. I know I went a little nutty but you know... Sets are like sooo much cheaper in the long run, if you do the Math (Not that I need any more masks. But I mean, like, a girl can never have enough masks! *does a hair flick*)! And here are the products, out of their boxes, basking in my love!!! Hahaha. Ever since I read the brochure, the Hungarian Water Essence has been on my mind and I knew that if I bought the Aqua Bomb, I would certainly buy this as well. I mean, this was formulated with the Hungarian water used by the Hungarian Queen Elizabeth! The Hungarian Queen herself!!! You know how some people are suckers for packaging... Well, I'm not like that because I'm gonna to throw them all when I'm done with the products (I don't have the space!!!). BUT I'm a total sucker for products used by ___(insert some famous person's name)___!!! Hahaha! I'm sooo using this tonight! I am not a queen but I can sure feel like one! Haha! 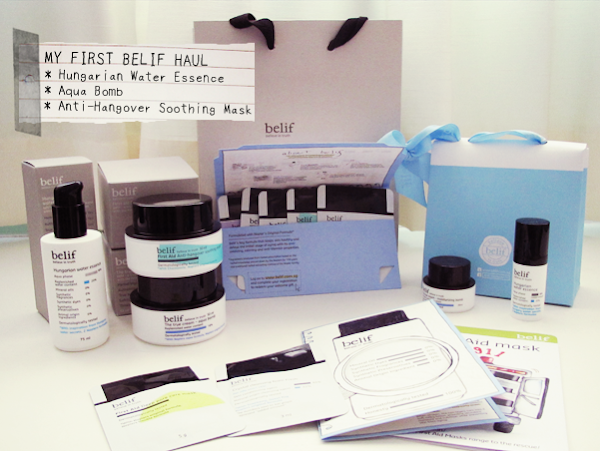 The First Aid - Anti-Hangover Soothing Mask came in a set with The True Cream - Aqua Bomb. This contains Chamomile, to calm sensitive and stressed skin, and Xylitol soothing capsules, that help to prevent skin woes. It's not like I need any more masks. Goodness, I have more than enough to last me comfortably for the next two years. But it really is cheaper purchasing the sets. Last but certainly not the least, The True Cream - Aqua Bomb!!! 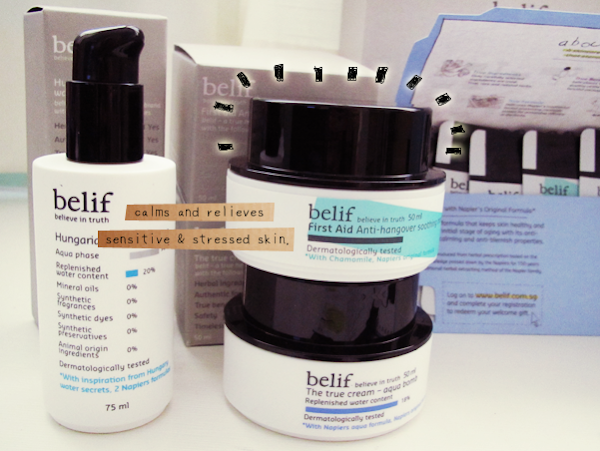 There are two 'bombs' actually, this one and the Moisturizing Bomb. 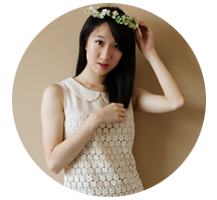 The former is meant for oily/ combination skin and the latter, for dry/ combination. Since my face is usually oily, I thought I get the former so that it wouldn't be too rich for me once my skin heals completely from the drought. Besides, I think it's actually moisturizing enough for my current skin condition. I activated my account by logging in when I came back, so this means that I'm entitled to a gift set when I go back to the store with my mailer, printed. It's a tad troublesome because I wish I could just collect it on the spot. But I guess, it's alright since I'm always at Orchard anyway. Haha.